Firefighters from the Beltsville area battled a warehouse fire today that escalated to 2 Alarms. At around 2:30 pm a 911 call reported a fire on the 1st level of a large warehouse in the 11400 block of Old Baltimore Pike. 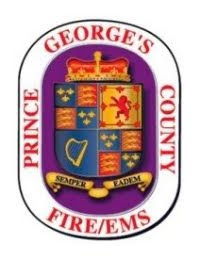 Firefighters from Prince George's County and Montgomery County arrived to find heavy smoke rolling out of the large overhead door and advanced hose lines into the structure. As the first arriving crew searched for the seat of the fire they ensured all 7 employees had safely evacuated. The warehouse was operating as Middle East Bakery and a fire was found involving an industrial sized baking oven. As firefighters were battling the fire on the first level heavy thick smoke started to come from the second floor office area and roof. A Second Alarm was sounded bringing additional firefighters and units to the scene. First alarm crews extinguished the fire and ensured all extension to the upper areas of the warehouse were also extinguished. There were no injuries to employees, civilian and firefighters. The cause of the fire is accidental and fire loss is estimated at $50,000.